Where do you turn for shelter in the worst storms of life? In “The shelter of God’s Promises” gifted Bible teacher and inspiring Woman of Faith speaker, Sheila Walsh, searches scripture for what God has promised us, what God’s promises mean, and how encounters with Christ are the eternal fulfillment of his unrelenting commitment to us. 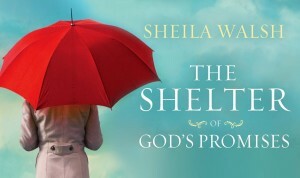 Through vulnerable storytelling and powerful in depth teaching, Sheila offers a life-changing study on ten bedrock promises of God, providing the foundation for daily confidence, joy, hope — and shelter. Who: For any woman who is serious about deepening her study of God’s Word, devoting herself to intercessory prayer, AND experiencing Christian Fellowship.